It’s not just the biggest beer event around here, but the upcoming Tailspin Ale Fest is getting national attention. And one reason is the presence here of Trevor Cravens, who started the Bowman Field with Tisha Gainey three years ago. 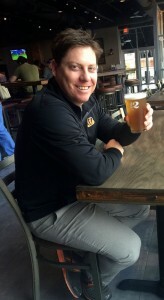 Cravens is also the president of DRAFT magazine, a national publication for craft beer enthusiasts. I’ve known Jon Fleischaker since the 1990s, when he was the lawyer my editors at Business First used to call to make sure my stories wouldn’t get the paper sued. Then I took him on unsuccessfully on the racquetball court. We’ve both retired from racquetball, but Jon is still the leading authority in Kentucky on First Amendment issues. He’s the first call for nearly every media organization in the state when it comes to a legal question. I’ve got a big announcement this week — March 2 is the date for the first-ever Cocktails with Champions event. I’m partnering with Ballotin Whiskey to introduce you to some cool cocktails at O’Shea’s on March 2. There’s plenty of other news and notes about the most interesting people in the ‘Ville, so download and enjoy!